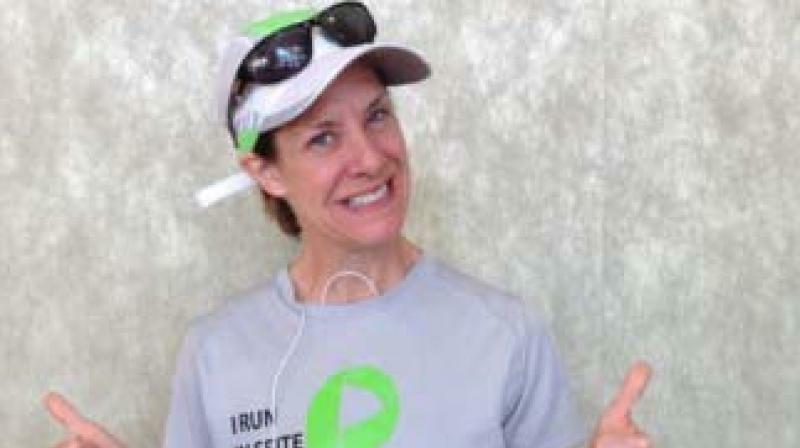 Angela Coulombe fought Lyme Disease (caused by ticks, and which can lead to death if not diagnosed properly) and went on to run the top marathons in the world including Boston, New York, London and Chicago. In August 2007 Angela Coulombe experienced the first symptoms of Lyme disease, an infectious disease which can be difficult to diagnose and causes tiredness, aches and loss of energy that can last for years. After her diagnosis and three weeks of treatment, she was anything but fine. “I could no longer turn my head, lift my arms up over my head, dress myself, climb stairs unassisted, get in and out of bed unassisted, roll over in bed unassisted, look after my two small children, or carry on anything resembling the normal life I had lived,” says Angela. With no cure, no help and no hope in sight after months of medication, she wished to die. Easier said than done, the best thing to do is take one day at a time, be positive, pick your head up when you are down and remember what may seem like the most devastating news in your life can always open doors to a whole new world of possibilities. The courage and persistence to keep going on, past hurdles and obstacles, is powered by purpose. YOUR PURPOSE. Some people won’t simply lie back and succumb. Angela knew a thing or two about beating the odds. Her resilience is a source of inspiration for anyone who is struggling. Angela was always athletic and as a child was into many sports. She had started running at the suggestion of a friend in 2006, but was now reduced to being a near invalid for almost two years. She says, “I could not see myself, once an active athlete and caring mother, living the life of an invalid while enduring the most excruciating pain I have ever known in my life. My sister told me of a doctor who was Lyme literate and might be able to help me. A beacon of hope came into my life. Under his treatment, I made slow progress. I started to regain my strength, appetite and ability to look after my children. After her journey to hell and back, Angela along with another Lyme disease sufferer, now runs to raise awareness about the disease and raise money for research, and connects runners who need support from a fellow “Lyme buddy”. As humans, we are all unique and different and we cope with circumstances in different ways and view life in different ways. “I would not want to tell anyone how to live, or what they should and shouldn’t do. My personal belief is that life is to be lived every day. I was determined to stay strong and fight until I couldn’t do it any more,” says Angela. A life-threatening disease can go wherever it wants. One can’t stop it, but it can’t take away our attitude and it can’t take away our faith. Too often, we tend to focus on the problems and difficulties along our path which are threatening to break us, but are probably not as rare, unusual or even impossible to overcome as we once thought. As Mary Anne Radmacher would say — Live with intention. Walk to the edge. Listen Hard. Practice wellness. Play with abandon. Laugh. Choose with no regret. Appreciate your friends. Continue to learn. Do what you love. Live as if this is all there is.